From the Electronic Holdings Report page, you can view and download Account-level and Product-level Reports. Account-level Electronic Holding Reports provide content you or your institution have full-text access to. Product-level Electronic Holding Reports provide content available to you that is included in the product/package or website. For Account-level reports, you can also select the format in which you want to view the report(EXCEL, CSV, XML, or KBART). 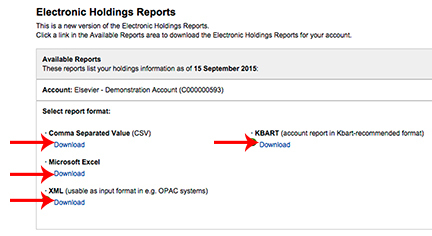 KBART Holdings Reports only contain subscribed titles. Then you can view, download, and print the report. To access the report, click here to access the report page directly or follow the steps below. Select the + symbol next to your username to expand the Username box. Select View Electronic Holdings Reports. The Electronic Holdings Report page displays. Select Download to start downloading the report format of your choice. Select the Books link on the navigation bar at the top of the ScienceDirect home page. 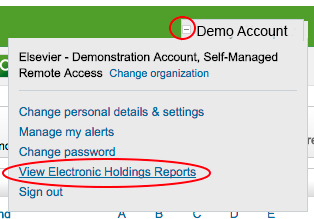 From the publication listing page, select the Electronic holdings reports link. The Electronic Holdings Report page displays. 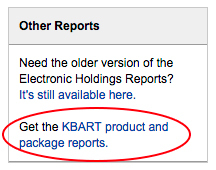 In the Other Reports section, select the KBART product and package reports link to download product and package reports in a format recommended by the KBART (Knowledge Bases and Related Tools) working group. For more on Electronic Holdings Reports on ScienceDirect go to http://help.sciencedirect.com/.